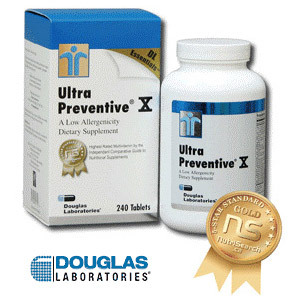 Douglas Laboratories Ultra Preventive X is ranked #3 in our comparison of over 100 popular multivitamin brands available on the market in North America. Below is our summary of the strong and weak points of this product, based on analysis conducted by the MultivitaminGuide.org team. Contains 67 nutrients: (the average multivitamin contains only 32 nutrients) making Ultra Preventive X one of the most comprehensive vitamin supplements on the market. Natural nutrients: Contains natural beta carotene, vitamin E and vitamin B12 (methylcobalamin), which means that the nutrients can be more easily absorbed by your body. High potency: The multivitamin has elevated amounts of all vitamins which makes it very potent and you are likely to see results from it more quickly. Organic blend: Contains an organic fruit and vegetable blend, which adds extra beneficial nutrients to the standard vitamins and minerals. Natural Folate: Contains Metafolin, a natural form of Folate (vitamin B9) which is more readily absorbed by your body than conventional Folic Acid. No enteric coating: Since the tablets and capsules are not enteric-coated certain nutrients may be degraded by the acid in your stomach, resulting in their incomplete absorption. Bulky: 9 capsules or 6 tablets need to be taken on a daily basis, making it a bit less convenient to take. Long-term use safety concern: Excessive amounts of vitamin A, equal to 300% of the Recommended Daily Allowance, may cause undesired side effects if taken over a long period of time. Overall Ultra Preventive X by Douglas Labs is an excellent product and we recommended it for individuals who need a highly potent multivitamin in order to recover from an illness or by athletes with elevated requirements for vitamins and minerals. Due to the very high amounts of vitamin A included, however we are hesitant to recommend this product for long terms use due to the risk of vitamin overdose, which can be associated with mild side effects such as dizziness, diarrhea, and stomach upset. Or in more extreme cases lung cancer and liver damage. Also if you have a sensitive stomach, a multivitamin with enteric coating may work better for you. How does Douglas Labs Ultra Preventative X compare with other multivitamin brands? MultivitaminGuide.org offers comparison between the Douglas Labs Ultra Preventative X multivitamins and of all major vitamin supplements available on the market. Some of the unique aspects of this guide include comparison of the Douglas Labs Ultra Preventative X multivitamins with 100 other vitamin supplement products, including popular brands such as One-A-Day, GNC, Equate, Kirkland, Shaklee, Nature Made, NOW Foods, Melaleuca, Puritan’s Pride, Herbalife, TwinLab, and Walgreens. The table below provides a summary of the Effectiveness Scores of some of the more popular vitamin supplement brands available on the market, including the Douglas Labs Ultra Preventative X multivitamins.